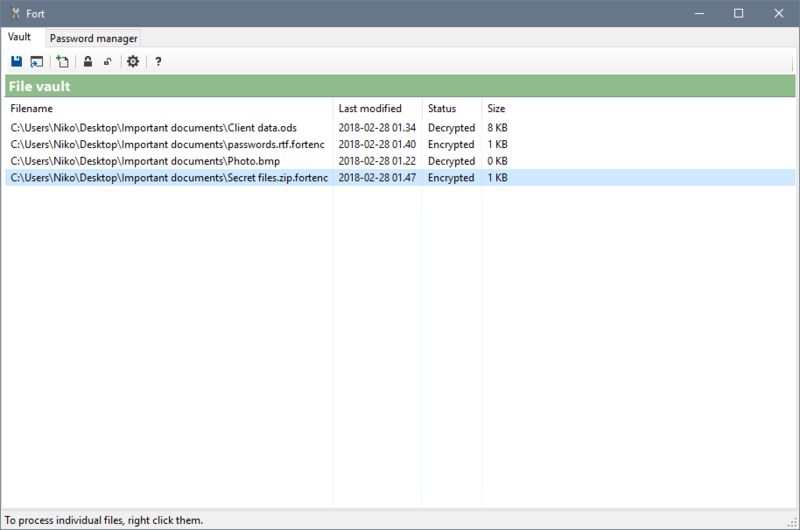 Fort is file encryption and password management software for Windows. Fort Professional 4.1.0.0 was available as a giveaway on April 21, 2018! 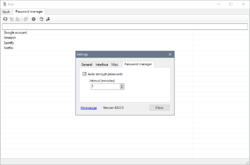 Fort is file encryption and password management software for Windows. Fort offers an easy and reliable encryption of files. Password protecting files and folders has never been easier. 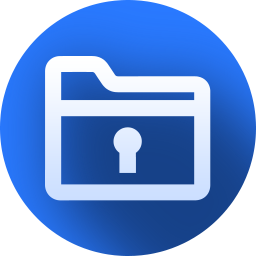 Fort can be also used to encrypt files and directories in Onedrive, Dropbox and other similar services. Can be run from a USB drive, portable version available. NB: Some antivirus programs might disallow Fort from working. Users can disable the antivirus, install the software, and enable it again. Please, be sure that all the programs are tested clean on www.virustotal before they go live. How would you improve Fort Professional 4.1.0.0? can I just use a file backup like with EaseUS Todo and create (1) single file and have it encrypt ? Anyone know a faster way to remove multiple files from the file vault ? (1) I was looking for (expecting) a downloadable User Guide, perhaps in PDF format, that would explain the concepts behind Fort as wall as everything about how to use Fort. (2) I would like to see a context menu entry (right mouse click) to select files for encryption directly from within File Explorer. That would be quite handy. Perhaps in a future version, Niko, if you think it's useful feature. Suggestions: (1) I was looking for (expecting) a downloadable User Guide, perhaps in PDF format, that would explain the concepts behind Fort as wall as everything about how to use Fort. (2) I would like to see a context menu entry (right mouse click) to select files for encryption directly from within File Explorer. That would be quite handy. Perhaps in a future version, Niko, if you think it's useful feature. Tony Austin, Fort actually included context menu entry. After installing Fort you can right click any file or folder, then you will see "Fort"-submenu. I had an earlier version of Fort and un-installed it to install the Pro version. Decrypting files encrypted under the older version worked fine, but re-encrypting them with the password previously used, results in a message advising that the password isn't strong enough, I don't want the make the passwords so strong that I can't remember them and have to record them somewhere else.Niko perhaps you can advise. Hi Mike, there's an option in the settings dialog to disable the password strength check. That should help. Thanks for the prompt reply , I changed the setting as advised and it works fine. Niko Rosvall, Thanks for the prompt reply , I changed the setting as advised and it works fine. Haven't worked with managing passwords yet, but I expect this to be just as strong and easy for that purpose. Don't think I'll have any doubt about recommending this software. Thank you for the GOTD. Installing the portable from your website gave me the same setup and resulted on no selection where to install. Got it on my C drive which was not the goal. Pls. advise. Installing the portable from your website gave me the same setup and resulted on no selection where to install. Got it on my C drive which was not the goal. Pls. advise. Thanks. Bernard, Portable version does not include installer. 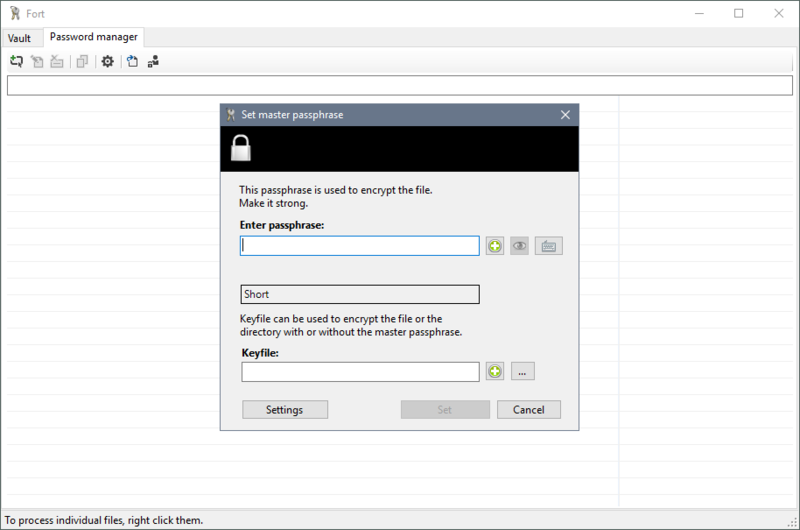 See https://file-encryption-for-windows.cryptoextension.eu/downloads.html Fort Portable. Just unzip and run the FortPortable.exe. No need to install anything. If you have a Windows 64 bit OS, run the program then launch Task Manager via Ctrl+Alt+Delete. Look for the executable running in task manager. If you don't see a *32 to the right of your running executable name, then it's a 64 bit program and you can easily put the folder in C:\Program Files then make the appropriate shortcuts to your desktop for future launching. Hope this helps. Bernard, If you have a Windows 64 bit OS, run the program then launch Task Manager via Ctrl+Alt+Delete. 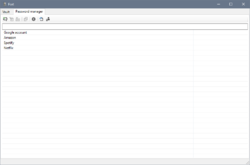 Look for the executable running in task manager. If you don't see a *32 to the right of your running executable name, then it's a 64 bit program and you can easily put the folder in C:\Program Files then make the appropriate shortcuts to your desktop for future launching. Hope this helps. It's portable. It does give you the option to choose where to extract it to when unzipping it. If you did not choose the right place and it extracted into your downloads folder, you can just drag and drop the extracted folder to wherever you want it. That is what I did. I downloaded the portable 64 bit file from their website and it validated with the license key in the readme file from the download from here. Looks to be working fine but busy with something and no time to try now, just wanted to get in in time to beat the deadline. And thank you to the developer and the GOTD team! Bernard, It's portable. It does give you the option to choose where to extract it to when unzipping it. 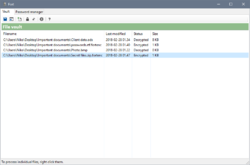 If you did not choose the right place and it extracted into your downloads folder, you can just drag and drop the extracted folder to wherever you want it. That is what I did. I downloaded the portable 64 bit file from their website and it validated with the license key in the readme file from the download from here. Looks to be working fine but busy with something and no time to try now, just wanted to get in in time to beat the deadline. I hope that helps. And thank you to the developer and the GOTD team! Hi...Can you import your passwords from another password program ? Also is there a way you can backup your passwords to an external source ? Christopher Phillips, At the moment you can backup the passwords from the password manager to a file. Not portable friendly. I registered and setup the application. It worked great. After moving the files to another drive. The software loads then closes. No errors, nothing. It just closes after the saving message. This is the same when using a USB and using it on a different device. The problem sits in the file "PortableRegistry.dat" on line 4. Here when you load Fort for the first time, it makes a reference to the current location (e.g: "G:\fort_app" when you move to another computer or move the files to another drive or location (e.g: "E:\fort_app" or "G:\fort_soft") the application is trying to locate files in a location that doesn't exist and therefor closes unexpectedly without any errors. You'll need to edit "PortableRegistry.dat" manually to fix the new location / drive each time you use it if the location is different. Fort Portable should not really rely on this method. It could just simply look for the folder "\Libs\Lang" from it's "starting directory" instead. I've coded many applications and I've always done this myself. Anyone worried about of losing passwords and the registration after this offer is available should backup the original zip file, the key and "PortableRegistry.dat" to a cloud such as Google Drive for future use in case of hardware failure or buy and support the developer if you like it or find you to use it a lot. Not portable friendly. I registered and setup the application. It worked great. After moving the files to another drive. The software loads then closes. No errors, nothing. It just closes after the saving message. This is the same when using a USB and using it on a different device. The problem sits in the file "PortableRegistry.dat" on line 4. Here when you load Fort for the first time, it makes a reference to the current location (e.g: "G:\fort_app" when you move to another computer or move the files to another drive or location (e.g: "E:\fort_app" or "G:\fort_soft") the application is trying to locate files in a location that doesn't exist and therefor closes unexpectedly without any errors. You'll need to edit "PortableRegistry.dat" manually to fix the new location / drive each time you use it if the location is different. Fort Portable should not really rely on this method. 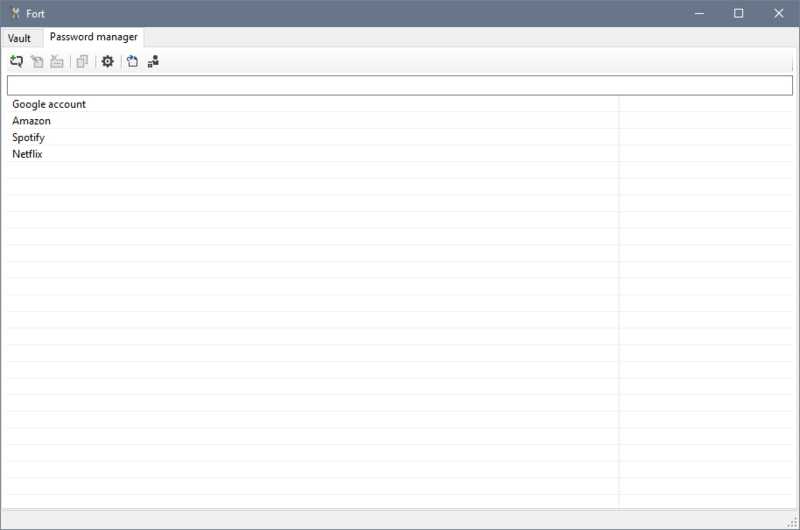 It could just simply look for the folder "\Libs\Lang" from it's "starting directory" instead. I've coded many applications and I've always done this myself. Anyone worried about of losing passwords and the registration after this offer is available should backup the original zip file, the key and "PortableRegistry.dat" to a cloud such as Google Drive for future use in case of hardware failure or buy and support the developer if you like it or find you to use it a lot. "current location" as in "C:\FortPortable\Libs\Lang" -> "\Libs\Lang"
Anonymous, I need to investigate this one. Thanks! You are correct that the problem is in essentially hard-coding the first-run path on line 4. I believe today's users can correct this with a ONE-TIME fix, however, by simply changing line 4 to ".\Libs\Lang" (minus the quotes; start with the period). It seems that the portable version works by writing to the registry (HKCU), then removing the registry info when it closes. This isn't necessarily a problem, it's how many of the PortableApps programs handle things too, but just a note in case the method is important to anyone. Niko, for the portable version I think it might be handy if it had only 1 download package that could auto-switch between x86 and x64 as appropriate for the system it's being run on. Otherwise, it becomes a pain trying to keep the database, settings, etc. sync'd between the two portable versions--unless the x86 version is fully functional on x64 systems, and doesn't have a significant performance hit either. It looks like the 'only' differences between the two versions, according to a CRC comparison, are about 10 files in the Libs folder. One option could be to rename the files that are version-specific, include both versions in the download, and have the program choose as appropriate. Thanks for this neat giveaway, I'm looking forward to trying it out more in the upcoming days! Anonymous and Niko, You are correct that the problem is in essentially hard-coding the first-run path on line 4. I believe today's users can correct this with a ONE-TIME fix, however, by simply changing line 4 to ".\Libs\Lang" (minus the quotes; start with the period). It seems that the portable version works by writing to the registry (HKCU), then removing the registry info when it closes. This isn't necessarily a problem, it's how many of the PortableApps programs handle things too, but just a note in case the method is important to anyone. Niko, for the portable version I think it might be handy if it had only 1 download package that could auto-switch between x86 and x64 as appropriate for the system it's being run on. Otherwise, it becomes a pain trying to keep the database, settings, etc. sync'd between the two portable versions--unless the x86 version is fully functional on x64 systems, and doesn't have a significant performance hit either. It looks like the 'only' differences between the two versions, according to a CRC comparison, are about 10 files in the Libs folder. One option could be to rename the files that are version-specific, include both versions in the download, and have the program choose as appropriate. Thanks for this neat giveaway, I'm looking forward to trying it out more in the upcoming days! By "ONE-TIME fix," I meant what seems to be a permanent fix--as opposed to "need to edit...manually...each time." I hope the rest of my comment was at least clear enough to muddle through. Just a point of clarification, because it's late and my brain was tired: By "ONE-TIME fix," I meant what seems to be a permanent fix--as opposed to "need to edit...manually...each time." I hope the rest of my comment was at least clear enough to muddle through. PortablesFan, I tried this, changed line 4 to ".\libs\lang" and the program ran fine BUT upon exiting the program rewrote the PortableResgistry.dat with the FULL path, not the relative one. So you would have to do this everytime. I archive some folders to an external hard drive rather than maintain them on my desktop Windows PC. The external drive isn't permanently connected to the PC and kisn't permanently on; I turn it on only when I need to update a file in one of the archived folders. It would be nice if I could use this software to encrypt a 'Finances' folder that's on the external drive but I don't know if it will work? I've tried several encryption apps before but although they work on the C drive (the desktop PC where installed) they don't seem to function where the external drive (usually Drive:G) is concerned. I archive some folders to an external hard drive rather than maintain them on my desktop Windows PC. The external drive isn't permanently connected to the PC and kisn't permanently on; I turn it on only when I need to update a file in one of the archived folders. It would be nice if I could use this software to encrypt a 'Finances' folder that's on the external drive but I don't know if it will work? I've tried several encryption apps before but although they work on the C drive (the desktop PC where installed) they don't seem to function where the external drive (usually Drive:G) is concerned. Advice appreciated. Thanks. Hi Claire. Fort will work for that purpose without problems. Open source or not this offer is worrisome. It comes across as "version 4.1.0.0, but AFAIK this is the only version ever released. If so it is not proven. Additionally there is a complete scarcity of independent reviews. Since it is unlikely anyone here has the tome or ability to proof the source, I would treat this with caution. Why turn over your critical files to a program/developer which is unrecognized by the security community. Open source or not this offer is worrisome. It comes across as "version 4.1.0.0, but AFAIK this is the only version ever released. If so it is not proven. Additionally there is a complete scarcity of independent reviews. Since it is unlikely anyone here has the tome or ability to proof the source, I would treat this with caution. Why turn over your critical files to a program/developer which is unrecognized by the security community. Diver Dan, Fort has been around since 2015. Here's the changelog: https://file-encryption-for-windows.cryptoextension.eu/news.html. werekong, Fort is for file encryption. It can encrypt files and folders. For drive encryption there's many other programs available. werekong, First off, if you are using Win7 Ultimate, there already is a tool for Drive Encryption. See the snapshot. Its does the job, but u shouldn't play when the task is in the process. Won't install this, as i am already using WinRar for this kind of job. werekong, First off, if you are using Win7 Ultimate, there already is a tool for Drive Encryption. See the snapshot. http://i429.photobucket.com/albums/qq12/pinso/2018-04-21_204903.jpg Its does the job, but u shouldn't play when the task is in the process. Won't install this, as i am already using WinRar for this kind of job. For file/folder lock software, use either Paid For or Free. Never use "giveaway with 1 day installation deadline" locking software. Never use "giveaway with 1 year license" locking software. There are many low price paid file/folder locking software. There are many FREE file/folder locking software. Try not to use locking software that has very complicated procedures. Try not to use locking software that insists you lock an entire partition; if your intention is to only lock 1 file. For file/folder lock software, use either Paid For or Free. Never use "giveaway with 1 day installation deadline" locking software. Never use "giveaway with 1 year license" locking software. There are many low price paid file/folder locking software. There are many FREE file/folder locking software. Try not to use locking software that has very complicated procedures. Try not to use locking software that insists you lock an entire partition; if your intention is to only lock 1 file. ricohflex, I wondered about this too, and checked (above) to ensure that it explicitly states "License: Lifetime"
GOTD team and/or Niko, just so that it's perfectly clear to everybody: ... Does this mean that Fort Professional 4.1.0.0 can be reinstalled after today's giveaway expiry date, and does it mean that reinstallation can only be on THE SAME Windows system, or can it be installed on ANY Windows system? ricohflex, I wondered about this too, and checked (above) to ensure that it explicitly states "License: Lifetime" GOTD team and/or Niko, just so that it's perfectly clear to everybody: ... Does this mean that Fort Professional 4.1.0.0 can be reinstalled after today's giveaway expiry date, and does it mean that reinstallation can only be on THE SAME Windows system, or can it be installed on ANY Windows system? Thank you for the great program. Easy to install, works very well. Very lightweight. Perfect. You stated that "The encryption part of the code is completely free and open source". Could you explain this a little further and provide a link. consuella, Hi, here's some information https://file-encryption-for-windows.cryptoextension.eu/developers.html there's also a link to a Github. Thank you Niko and DJ for your replies. Niko Rosvall, thank you sir. Niko Rosvall, dont really know what to do now, since i deinstalled everything there is no fks file anymore where my passwords were and i can not create a new one, do i have to reset the program via registry or anything? Max, fks files do not store passwords. They are key files. You can create a new keyfile anytime you want. Also uninstalling does not delete key files, it could not, they are files which the installer does not know anything about. So, the fks file is still on your computer, or at least uninstalling Fort did not delete it, it can't. Niko Rosvall, ok ok, it was in my bin for some reason, got it back. Tho the prgramm still says: "Something went wrong, cannot decrypt passwords. Operation aborted." Niko Rosvall, okay so atm this program is not usable at all, the weird issues i had at first are gone, but i can not use any password manager stuff because i cannot enter it with my passphrase. It always shows the error message. 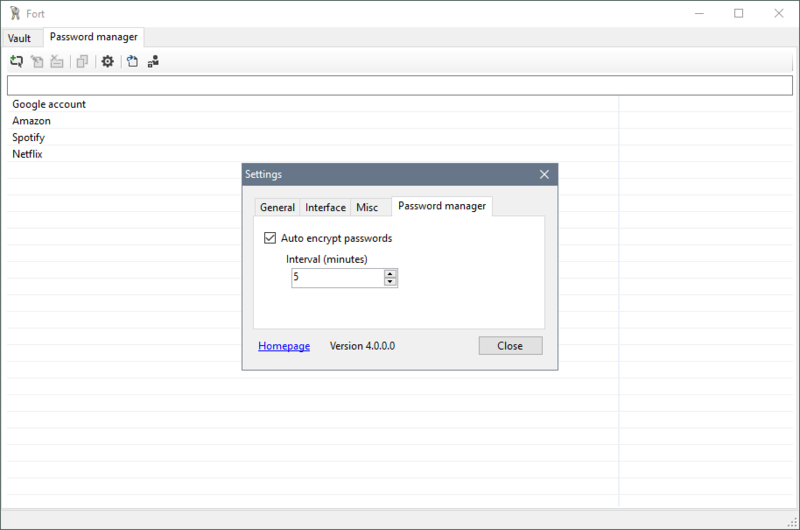 Niko Rosvall, okay so atm this program is not usable at all, the weird issues i had at first are gone, but i can not use any password manager stuff because i cannot enter it with my passphrase. It always shows the error message. I dont mind having to redo all the password information but id like to setup a new passphrase and keyfile because of that error thingy How do i reset it? Great software easy to use and easy to install/register and a life time license Thank you.